The play "Karukaya Dôshin Tsukushi no Iezuto" was originally written for the puppet theater (Bunraku) and staged for the first time in the 8th lunar month of 1735 in Ôsaka at the Toyotakeza. It was adapted for Kabuki the following year and staged for the first time in the 1st lunar month of 1736 in Ôsaka at the Kado no Shibai (unknown casting). "Karukaya Dôshin Tsukushi no Iezuto" is made up of 5 acts. "Imorizake" is the last scene of the third act. The daimyô Katô Shigeuji has retired to a monastery located in the heart of Mount Kôya, calling himself Karukaya Dôshin. His domain is now managed by his wife Maki-no-Kata. A neighboring daimyô named Ôuchi Yoshihiro, covets a gem, which belongs to the treasure of the Katô clan. He plots to get this treasure with a diabolical plan: he counterfeit an imperial proclamation, which says that all the daimyô are under the obligation to give their priceless gems as gifts to the Emperor. Yoshihiro will play the role of the envoy, who will be in charge of receive the gems from the daimyô and to bring them to the court in Kyôto. Kenmotsu Tarô, Katô Shigeuji's faithful and ingenious retainer, has the brilliant idea to tell Ôuchi Yoshihiro that only a virgin, who has to be twenty years old, can touch the gem. Anybody else would turn the gem into a valueless black stone. His secret hope is that such it will be very difficult to find 20-year old virgin in a country where girls get married in their early teens. Unfortunately for Kenmotsu Tarô and Maki-no-Kata, Ôuchi Yoshihiro has found a girl with the perfect features: her name is Yûshide, the 20-year old daughter of Ôuchi Yoshihiro's retainer Tatara Shindôzaemon. Yûshide serves in the great Shrine of Ise, where only virgin maidens are allowed to be. Moreover, she has no fiancé. Ôuchi Yoshihiro sends Yûshide, who will be escorted by her father, to the palace of the Katô clan. Her mission is to bring back the precious jewel. The Katô clan, which is aware of Ôuchi Yoshihiro's plot, tries to find a solution to deceive both Tatara Shindôzaemon and Ôuchi Yoshihiro. The perfect plan is masterminded by Kenmotsu Tarô's wife Hashidate. As Tatara Shindôzaemon won't be stupid enough to accept a fake gem, she says that they should take advantage of the presence in the palace of the young and beautiful Onnanosuke, Kenmotsu Tarô's younger brother. This young lady-killer is desperately asking for forgiveness because all his love affairs, which have ruined his reputation. They firmly believe that Onnanosuke will easily seduce Yûshide, who will certainly lose her virginity. Then, they will give a black stone to Yûshide and let her believe that her impurity has corrupted the gem. When Yûshide arrives at the palace, she is welcomed by Hashidate, who introduces her to Onnanosuke and explains that this young man will take care of her. It is love at first sight for Yûshide, who is immediately attracted by the beauty of Onnanosuke. Hashidate tells them that it is the day of the household festival and the tradition is to offer some sake from the sacred altar to the guests. Yûshide accepts the offer but the drink drives her to lose all her reserve and, to Hashidate's satisfaction, she openly start to seduce Onnanosuke. Hashidate promptly leads the two young people to a private sleeping room, where they will surely make love. As part of the plan, Hashidate has replaced the usual sake by a strong love potion, which is called imorizake. Tatara Shindôzaemon arrives at the Katô palace. Hashidate tries to save time by discussing with Yûshide's father. Then, Yûshide, who has finally lost her virginity, comes to the room accompanied by Onnanosuke. She carries the sacred box, which contains the treasure of the Katô clan. She opens it before her father. Tatara Shindôzaemon is astonished to discover that there is only a little ugly black stone in the box. He accuses Kenmotsu Tarô of replacing the real gem by a fake stone but Hashidate says that the gem must have changed into a black stone because a non-virgin maiden touched it. This is a strong accusation against Yûshide, who is fully aware of her mistake. 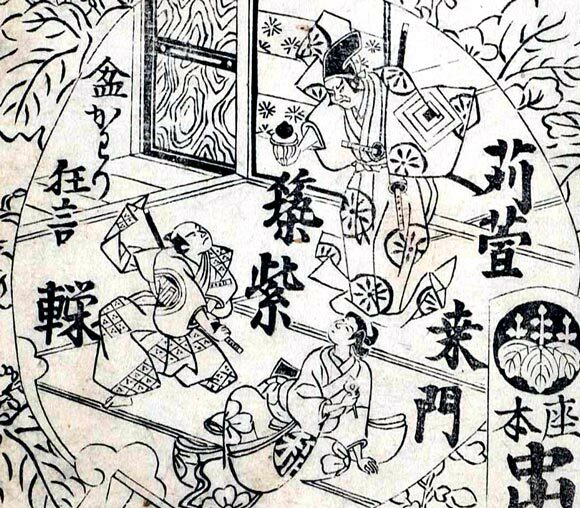 Yûshide takes a white arrow, which she uses as a hair ornament and which symbolizes the great Shrine of Ise. She stabs herself in the throat with this sacred arrow and confesses to her shocked father that she had indeed fallen in love with Onnanosuke and that she was no more able to control herself after she drank the sake offered by Hashidate. Tatara Shindôzaemon suspects that her daughter was in fact tricked by the leaders of the Katô clan. He suddenly takes the bottle of sake out of the sacred altar and breaks it. Inside, he finds a pair of male and female newts, which are said to be the perfect ingredients of a strong love potion when they are mixed with sake. Shindôzaemon wants to take his revenge on the spot and asks who is the culprit. Onnanosuke gives himself up to his lover's father and is ready to be killed. Yûshide, who is about to die, asks Onnanosuke to promise that they will marry together in the afterlife. Full of remorse, Onnanosuke makes the promise of marriage and Yûshide happily dies. Hashidate weeps, regretting what she has done to this innocent woman. She request Tatara Shindôzaemon to kill her after the killing of Onnanosuke. Yoshihiro's retainer raises his sword, but to Onnanosuke and Hashidate surprise, he does not kill anyone, only destroying the black stone. He explains that this evil object is the only culprit for his daughter's death. He advises Maki-no-Kata to run away with her son to find shelter at Shigeuji's monastery in the heart of Mount Kôya. Then, it is time for him to leave the palace and this is the end of this play.